GMA artist and tween star Barbie Forteza joins the number 1 music company in the Philippines MCA Music as one of its recording artists. 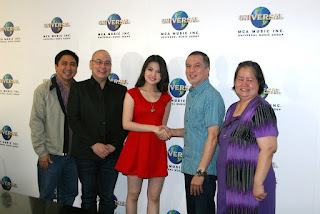 She recently signed a record deal which was witnessed by MCA Music President Ricky Ilacad and its executives Wilson Cruz (Marketing and Sales Director), Kiko Guevarra (Artist and Repertoire Manager) and Mark Bonifacio (OPM Label Manager) as well as GMA Artist Center Head Arsi Baltazar and Contracts Administration Section Manager Vic Del Rosario. Forteza now belongs to MCA Music’s growing roster of OPM artists which includes popular solo acts like King of Acoustic Pop Nyoy Volante, Asia’s Acoustic Sweetheart Sabrina and It Girl Solenn Heussaff as well as top-notch bands Urbandub, Pupil, Franco, Chicosci, Tanya Markova and Pedicab. It is also home to the most in-demand international artists like Justin Bieber, Taylor Swift, Selena Gomez, Mariah Carey, Psy (Gangnam Style), Maroon5, Greyson Chance, Nicki Minaj, The Wanted, One Republic, Phillip Phillips, Jessica Sanchez and many more. She is currently starring in the GMA drama-fantasy series “Paroa: Ang Kuwento ni Mariposa” where she plays the lead role Mariposa. This comes after the success of her TV series “Luna Blanca”. Watch out for Barbie Forteza’s album which will be coming out soon. Expect surprises from this young star as she embarks on her another facet- singing. “I am so honored to be part of MCA Music and I hope you will support my upcoming debut album the same way you supported me in my TV shows,” Barbie said.